Note:Please Read The User's Instructions Carefully Before Using The Product. 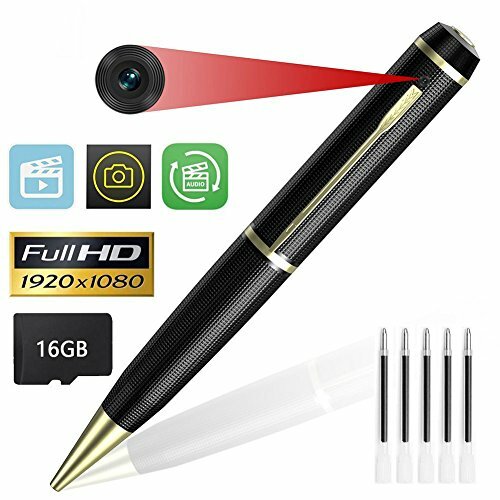 1 X 1080P HD mini pen camera. 1 X 16GB SD card. The camera device is incredibly tiny, making it perfect for covert applications.1080P HD Video Quality ULTRA High-quality 1920x1080p video recording makes a very smooth recording, perfect at up to 30fps (frames per second) for posting on YouTube, Facebook, or for your own fun. Support up to 32GB Memory This high tech spy pen that supports up 32GB of memory. 32GB Memory installed is enough for HD 1080p video & take a picture. To access the video files, simply plug the pen into the USB of your PC or Mac and browse the files. Take Photographs Take photographs instantly with a touch of a button, any time you need to. After that, you can print them or see them on your computer. I.Connect the pen to the computer through USB, find the "userconfig.txt" text notepad in the root directory, open and set up your local time, save "userconfig.txt". II.If you are connected to the computer through the USB, open the mobile disk, did not find the "userconfig.txt" text file, you can create a text notepad(userconfig.txt) manually, you will enter into local time and save time, input format: Year-Month-Day hour: Minutes: seconds(eg:2018-03-23 14:22:16). Note: Please pay attention to every recording video or photo. The timestamp is based on the time you set in the userconfig.txt document, and it doesn't change with the real-time, this requires you to manually set the time. If you want to move/copy the content to your Macbook, it is only working via the card reader. Play video could through direct insert the pen in Mac. Spy pen pinhole camera capable of recording high-quality 1080p video with sound; The camera device is incredibly tiny, making it perfect for covert applications. HD 1920*1080P Video Resolution:Frame rate is 30fps,lens angle is 85°, 60mins video record,AVI video format, meticulously engineered to perfection for crystal clear video recording. One Button Operation: Just one click on and one click off allows you to start/stop recording video and take a photo right away. Loop Record: When the SD card is full, it will automatically overwrite the oldest video files with new ones. note this mini pen camera doesn't have WIFI function, the camera must plug in SD card to work. MicroSD Cards Min & Max Supports: Mini pen camera supports microSD cards with at least 4 GB and max 32GB capacity (include 16GB SD card). If you have any questions about this product by KIMUVIN, contact us by completing and submitting the form below. If you are looking for a specif part number, please include it with your message.